It causes conflict in the family. The judge will need to appoint a personal representative, go through to determine who the rightful heirs are, and the family may be put at odds with each other. In fact, seeing this conflict first hand is a large motivator for clients to get their own Estate Planning in order so their family does not have to go through stress. It is public record. This means that anyone could go to the court to review the records, finding out the level of assets, who received assets, and other personal information. What causes the need for a probate proceeding, even if you have a trust? A trust that has not been fully funded. Through this post, we hope you will learn about funding and why this is so important. What Does it Mean to Fund Your Trust? Funding a trust is the process of transferring assets from your name into the name of your trust. Often, beneficiary designations are changed to your trust as well. Changing the title of the asset from your individual name (or joint names if you’re married) to the name of your trust – for example, from Peter Rabbit to Peter Rabbit, Trustee of the Peter Rabbit Revocable Trust dated January 1, 2019. Declaring your interest in an asset without a title (personal property, such as artwork, jewelry, collectibles, personal automobiles or even cryptocurrency) are considered a part of the trust. Changing the primary or contingent beneficiary of the asset to your trust. Note: We will give you a template for your assets, broken down by type, for you to complete. This allows us to first, advise you on how to fund the trust for the different asset classes and second, provides a helpful guide for your successor trustee as to what assets are current. What happens to assets that were not funded to the trust? As mentioned, for many people, avoiding probate court is a main reason they set up a revocable living trust. After the trust has been executed, the trust MUST be funded, or the assets will go through the probate court process. This, unfortunately, is a reality for many people, particularly those who use DIY or cheap high volume methods for Estate Planning. We have had many clients who completed their original trust many years ago and either were never advised on how to fund the trust or they did not take the steps. When they come to the firm, we let them know that if something had happened, the assets would have gone through probate. Even a previous firm our attorney worked with did not emphasize funding well, only asking clients which financial institutions they used when signing the documents (and many times, they would not remember them all at that point, explicitly wishing they knew about this need beforehand), briefly going through funding, and failing to follow up. This meant that many of those clients did not understand the vital importance of funding. So when working with our firm, whether it’s your first time or third time doing your Estate Planning, we make funding a priority. This is why we provide the template for inventory of assets ahead of time so that we know what questions to ask our clients and also can guide them through since certain financial institutions have different procedures for funding. We also follow up with our clients three months after the trust has been executed to see how their funding is going and make ourselves available for questions on funding. Our biggest fear is that a client will go through the Estate Planning process, then neglect to fund the trust, and have their entire planning go to waste. Which Assets Should, and Should Not, Be Funded Into Your Trust? On the other hand, there are other assets, that, depending on your particular family situation, may or may not be included with the trust. This is one reason why it is very important to work with a good attorney on how to fund your particular trust. What Are the Benefits of Trust Funding? Your trust is a living document that can be updated if your life circumstances or wishes change. Your trustee will have direct access to your trust assets without a court order. Your trustee will be able to pay bills and manage, invest, sell, and reinvest your trust assets for your family’s benefit without needing to go through any court process. Your private wishes will remain private, unlike the public record created by the probate court. Settlement time, costs, and frustration are reduced. Trust administration does still take some time, but is much easier for your family. A trust has many benefits and purposes, including probate avoidance. 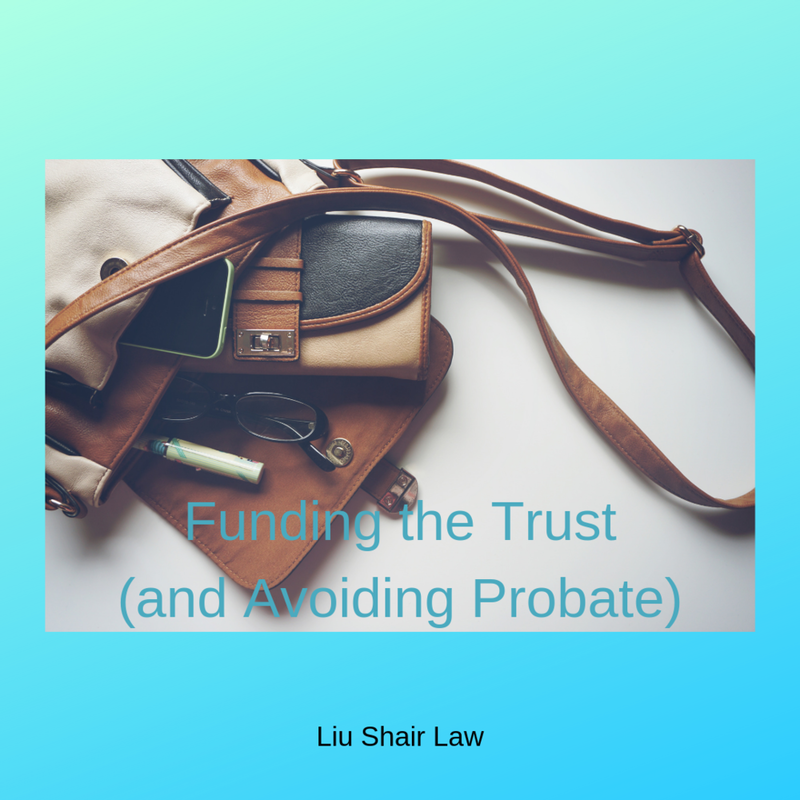 However, a trust itself, doesn’t avoid probate if it hasn’t been funded. A trust is like a purse: it needs to have money and items put into it in order for it to work properly. If you are looking into Estate Planning, please make sure to seek competent counsel that will take the time to understand your needs, your assets, and your goals so that a customized and comprehensive plan can be created. If you have already completed your Estate Planning, please revisit your plan every three years or whenever there is a major life change to ensure that the plan reflects your current wishes or situation. Please also make sure that your trust is fully funded (both with existing assets and newly opened/acquired assets) and that your successor trustee is well aware of what assets exist. If you are a Liu Shair Law client and you have questions about funding the trust, please do not hesitate to get in touch and ask questions. We have worked with many clients to ensure their trusts are funded based on their particular funding needs.